On Thursday the NHL released a list of You Can Play ambassadors for each team in the NHL. Among these names is Andrew Shaw. If you need a refresher course on why a lot of people are upset about Andrew Shaw, see this clip at about the minute mark. Unlike what Outsports reported in their release of ambassadors, Shaw was suspended by the NHL for one game and fined $5,000 the day after the incident. The night that it happened, it became viral on the internet, which is most likely the reason it was even dealt with in the first place, but that is for another post. With Shaw being a YCP ambassador it becomes a redemption arc for him, a straight white man. Not the LGBTQIA+ that were upset and triggered by what he did. Had there not been the push back in the first place, would be have been fined and suspended by the league? What matters here is, Queer voices are drowned out by straight voices, they always have been. But Queer voices are more than just privileged white gay males. They are Trans* Latinx, non-binary folk of color, Queer women of every race I used the term Superior Gay in a conversation with a friend last night. That is who drives the narratives. I’m an angry, exhausted, and emotional Queer Woman with a voice and a platform to speak. Keep your straight redemption arcs for movies. Let us, the real world working Queers who happen to have a voice in the community tell the stories. It’s not nice that he has come ‘full circle’. This is a way to get people off of his back about what happened last season. And most definitely, don’t let the person who called Queer Athletes cowards for not coming out, drive the narrative. Someone who thinks that athletes should come out no matter what should not be the one writing about how this effects the other parts of Queer culture. Coming out is hard and a privilege that not everyone has. This brings me to a conversation I had with Nick Costonika, who wrote about Shaw and him being the ambassador for the Montreal Canadiens. @sarahhowling The point of writing about Shaw — and of Shaw being an ambassador — to engage people who otherwise wouldn’t read about this. @cotsonika the LGBTQIA+ Community is very very not on board with how things have been handled. It’s upsetting to see it set as redemption. @cotsonika especially for me, someone who is A) Queer and B) was severely upset and triggered by what he did. @sarahhowling I also spoke to three people from the community who are on board with this. @cotsonika write* who are Queer and not down with that’s going on. @sarahhowling I don’t think being an ambassador redeems him. I do think it can be a positive thing if he’s sincere, and he appears to be. Costonika displayed the classic signs of ‘not getting it’ and I had to stop engaging. Telling a Queer woman that ‘it’s okay because I talked to three people who think its good’ is not a good way to try to change someone’s mind. Three people in the LGBTQIA+ community? A whole three people? Wow, amazing, but I digress. The danger of using Shaw as an ambassador is that it becomes about him and his redemption and it is there purely to make the straight white male hockey fans feel better about Hockey is for Everyone month. Notice how some teams are having Pride Nights, but the rest are just having Hockey is for Everyone nights. Having a Pride Night would mean more to a section of hockey fans and writers who are disenchanted with the league and it’s mainly straight writing staff. 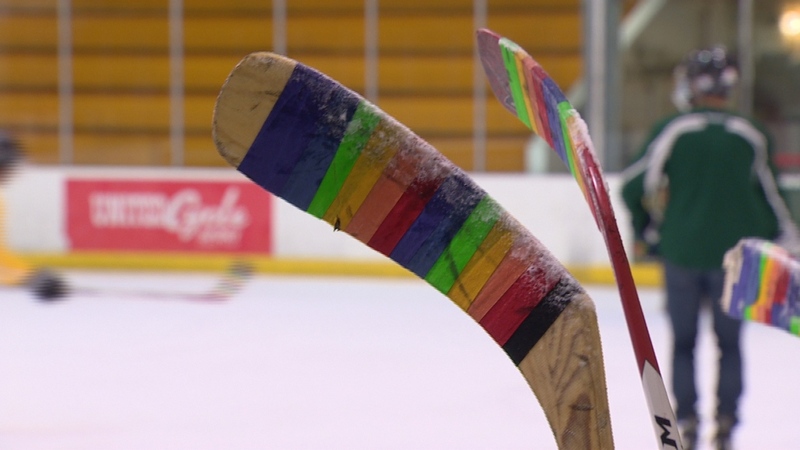 Saying that they are inclusive and throwing Pride Tape onto their sticks, doesn’t make us feel any safer. I admire what You Can Play is attempting to do, but in reality, it feels like it is there to make straight people feel better about a problem. They ‘fix’ it and cis-het fans can go about their lives and think its cool when they do ‘supportive’ things like YCP nights. Or when a team goes to Pride. Recently, Brad Marchand was very vocal on twitter about homophobia and not standing for it when he called someone out. This is an example of good work and support. Braden Holtby of the Capitals marched during Pride in DC, but then turned around and was very insensitive to Trans* and Non-Binary people by dressing as a ‘bearded woman’ for Halloween. That is an example of you didn’t even try at all. Shaw is trying to martyr himself for the cause. He’s like every jock in high school who screwed up, tries to help the *insert description of not popular and mocked person here* and be their ‘friend’ in the public eye, but still act the same way as they have in the past at home. Yes, people can change, but this does not make me feel safe and secure. If the Habs have a queer player, I don’t know if they would either. Shaw going from ‘I didn’t mean to say it’ to ‘I’m your ally’ is not enough. Using the term Ally makes straight people feel better and no, the A in LGBTQIA+ is not for you. Is there someone else from the Habs you would have preferred as their ambassador? Likely nothing done or said by anyone will be enough for you, it must difficult to go through life when every little thing upsets you.